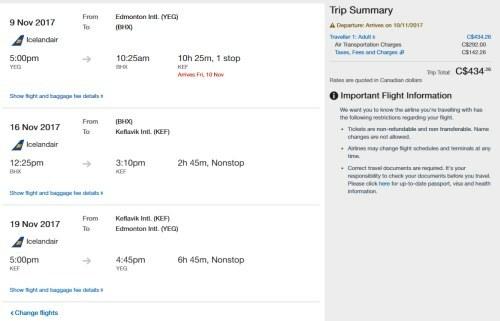 Icelandair has dropped the price of their off-season flights from Edmonton to Birmingham, UK down to $435 CAD roundtrip including taxes. The flight on the way home has an overnight layover in Iceland. It's possible to extend this layover in Iceland to multiple days. November is obviously not an ideal month to visit Iceland (cold), unless perhaps you're into northern light viewing. With Icelandair, 2 pieces of checked luggage are included free. Use the same dates as shown in the list above. edmonton, yeg, flight deals, europe, western europe, northern europe, united kingdom, icelandair, nordic countries, reykjavík, iceland, kef, reykjavik, birmingham, bhx and uk.